On a regular basis I visit care homes to support the delivery of their wellbeing programmes, and I often hear that it’s an uphill battle to encourage others to support with activities. So how can the Activity Lead play a key role in inspiring others through wellbeing? There’s a reason behind referring to wellbeing, as opposed to “activity”. This is not only to acknowledge the full 360 degrees of health benefits gained from activities, but also to break down the barrier of the word “activity” itself. “Activity” has a stigma attached to it, and is often perceived as a 45 minute period, a large group event, or something that involves arts and crafts. It is often considered as something that is solely the Activity Lead’s responsibility. Essentially, this word provides a lot more barriers than the term “wellbeing”. The World Health Organisation defines health as a “state of complete physical, mental, and social wellbeing, and not merely the absence of disease or infirmity”. This provides a platform for wellbeing within a care setting, ensuring that each and every interaction can tie into these three key areas. It’s important to develop a varied programme that focuses on different benefits. These benefits can then be celebrated to show the significance of a good wellbeing programme in the home and should support creating a whole-home approach to activities. It becomes more than just that singing and dancing activity, it becomes something that allows people to live life to their potential. Hence, to encourage support from others, we need to highlight what we have achieved. Having the ability to promote outcomes from activities gives people the opportunity to buy into what we are working towards, showcasing the significance behind what we’re doing. Mobility, dexterity, communication, concentration, friendships, motivation and confidence are a few areas to focus on. If you can develop an understanding of why you run each activity, this will support the vital evidencing and celebratory aspect of wellbeing. So often I hear about fantastic achievements, but these are not highlighted to the rest of the care setting – or on the other hand, they are, but very infrequently. This is a huge oversight, as celebrating these achievements is a great way to change people’s perceptions of what activities truly are. Life stories are a great way to engage the wider team in wellbeing, whilst ensuring that individuals live life to the full. 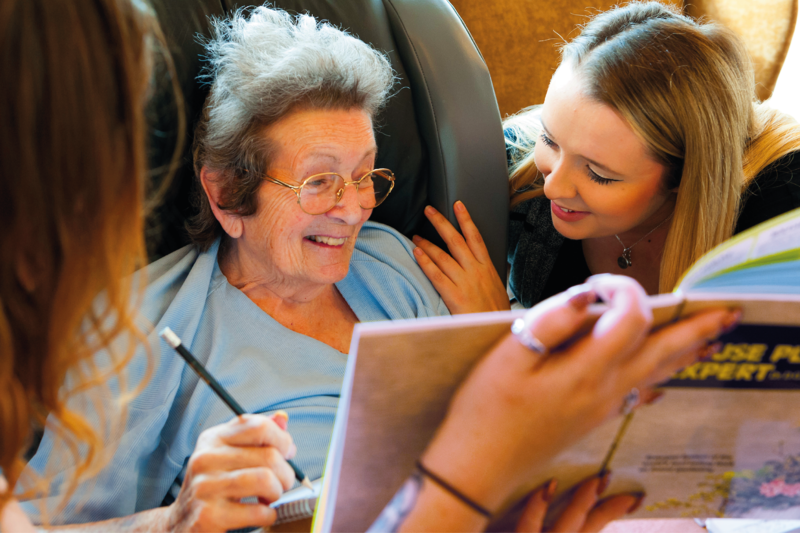 The Activity Lead can therefore play a key role in creating disguised activities – life stories can provide fantastic information to support interactions between everybody in a care setting. The more people know about an individual, the more this will influence meaningful interactions and will then transfer through to a whole home approach, where everyone plays a part in activities. It’s not necessarily an easy journey, but taking some steps to inspire others through wellbeing can make all the difference to your programme, and ultimately to the lives of the residents in your care setting. Photo taken at Park View Care Home (First Care).